Bana grass is a particular variety of Pennisetum. Its amazing growth power makes it suitable for many purposes, from tall grass hedge to fuel and fodder. A surprising alternative to more conventional hedges, bana grass can grow quite tall within months. It won’t survive the cold, though, so this plant is for mild-to-tropical climates. Best start planting bana grass in spring in temperate climates, to give it time to grow. In warmer regions, plant throughout the year, but, if possible, favor the rainy season to make watering easier. For the first few weeks after planting, water often to ensure the plants settle in properly. Since bana grass is an easy plant to please, it can grow in any type of soil, even extremely poor, rocky or stiff slopes. You can propagate your bana grass easily through division of the clump in fall or at the beginning of spring. Layering is also a favored way to propagate your bana grass. Marcotting or air-layering works well, too. This is convenient if you haven’t much space to reproduce the plant. Lastly, it is also possible to chop bana grass stems into 8-inch (20 cm) portions and bury them about 4 inches (10 cm) into the ground. These are called stem cuttings or setts. For marcotting, layering and stem cuttings, check that at least one node is under the soil level. Roots and leaves will sprout from the nodes. In colder climates, cut back dried leaves at the beginning of spring to regenerate the plant. Cutting back means removing everything taller than 8 inches (20 cm) from ground level. If you leave the bunches whole over winter, you’ll take advantage of their beauty for longer, since they’re still very beautiful even when dry. Protect the clump with mulch if you fear cooler temperatures. Unless the clump has frozen over, it should sprout again in spring. In warmer climates, bana grass can grow extremely fast. If you have animals like cows, sheep or goats, you’ll be able to harvest and feed them your bana grass within 2½ months. It will grow back again. Grow it for 4 months for it to reach about 6 feet (2 meters) if you want to harvest it and dry it for long-term storage as fodder. Let it grow for 9 months if you plan on harvesting it for energy and have powerful machinery to collect it. Bana grass doesn’t fear dry spells once its roots have sprouted, which is why it is great for growing in places that are hard to irrigate. Bana grass grows extremely rapidly in proper conditions. It also fares better than most other grasses even in a poor growing environment. A couple rows will quickly grow to form a tall impenetrable hedge. A line of bana grass will act as a wind breaker to protect weaker plants. Plant it in hard-to-till places or slopes to maximize productive area. Fodder is a great way to use the plant since cows, horses, sheep and goats will relish this plant. Grow this plant to produce large amounts of organic matter from poor soil, to use as compost in more valuable land. is a patented variety used for energy. Growing that specific variety is not allowed without a contract. A very beautiful perennial that grows in tropical areas, bana grass is native to Africa but is increasingly grown in Asia. It was first developed in the 1950s and has constantly been the object of research to better understand its potential. 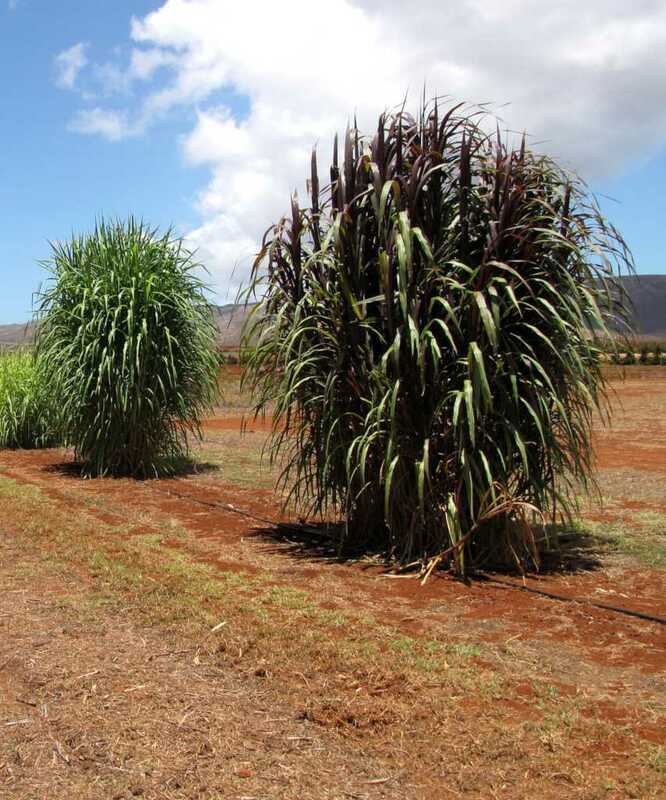 It’s considered more digestible by livestock than Napier grass, its parent plant. This plant can grow tall and dense in harsh, poor, dry environments and is easily propagated. Bana grass is a hybrid variety of Napier grass, Pennisetum purpureum and Pennisetum americanum. There are many varieties, for example ‘Purple Bana grass’. Babala and Napier, the local names of the parent grasses, gave the new name: “Bana grass”. Lay one stem down in the direction you want to propagate the plant and cover it with soil. It will sprout new stalks at each leaf node! Thanks for the info, eager to see this wonder plant. Hello Reon, a lot of research was done by the University of Pretoria. Perhaps they could tell you where it’s being currently grown in South Africa, or they might have samples available or experimental plots you could visit. Another option is to ask your local seed store or seed producer, they have the local networks you would need to find bana grass cuttings. A last option is connect to co-ops and / or local permaculture groups. Since bana grass is a great help for their concerns, they’re likely to find ways to help you out.